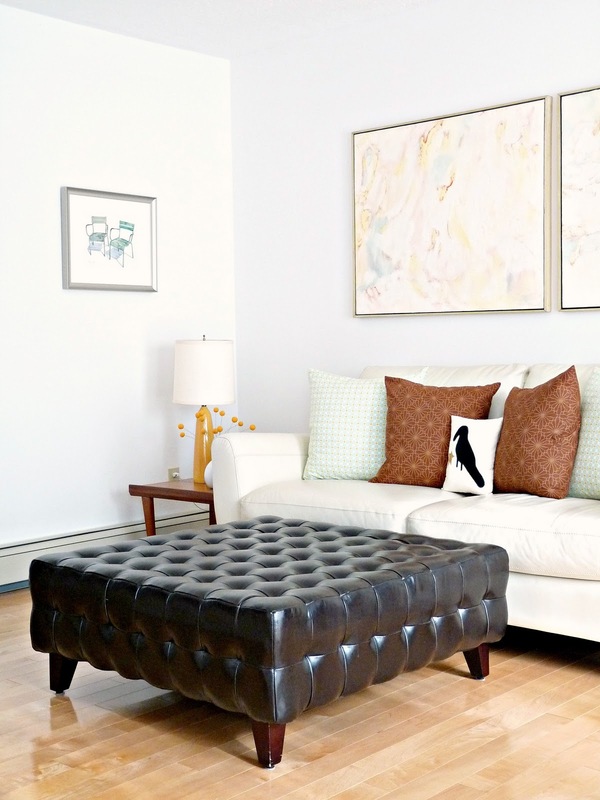 Monday I blogged about giving the old sofa the heave-ho. Yesterday you met the new-to-us sofa. One last post before I move on from the sofa topic: how we managed to get a cream-coloured sofa home from the seller’s house. We searched for a mover on kijiji.ca﻿ (seemed fitting) and prices ranged from $50-85 for a sofa transport 15 km, with hubby providing one-half of the required muscle. After some chatting, one mover agreed to $40 but his van, although clean, wasn’t cream-sofa clean (nor were his hands, I’m betting). And, although leather is easy to clean, I cringed at the thought of mucking the sofa up before we even got it home. But between the two of us, Hubby and I (mostly Hubby) have moved about seven times in ten years, so we’ve picked up some tips & tricks. What’s our tip in this case? Furniture-sized plastic wrap! Office supplies stores and Costco both carry this delightfully clingy wrap and we’ve use it to wrap furniture, artwork, things that won’t fit into boxes – even to keep drawers from sliding out of dressers during a move. That’s the secret to how the cream-coloured sofa stayed smudge-free on the journey over. Maybe we should have left the plastic wrap on so we can keep it that way? Great tip! I've been wondering where I can find a roll of that stuff for my upcoming move but didn't know where to look. I already have a roll of a narrower width and love it. Thanks! Definitely a pro trick. What kind of material is the new sofa? Glad I could help!The new-to-us sofa is leather. Pretty durable and easy to keep clean, but we've never had a light-coloured sofa, so I will be fussy with it for awhile! Oh that's brilliant! Pre-kidlet, I had a cream sofa, and I had it steam cleaned once — and they had to come back and do it again because, they said, cream streaks badly. Now we have a deep red one. That stuff is great. I don't know how people move furniture without it. we bought a floor model cream coloured sofa set from sears upon moving into our new house. they wrapped it right up tight, just like that. i was very impressed by how well they cared for their furniture, especially given that it was a floor model!